High pressure will bring the Finger Lakes a couple of more dry, sunny days Friday and Saturday. A few showers and storms enter the picture Saturday evening into Sunday. The simply picture perfect weather the Finger Lakes has been basking in the last few days will continue for Friday and, for the most part, Saturday as well. High pressure remains firmly in control of our weather, with no nearby weather systems to even increase our cloud cover. Clear skies this morning will gradually fill with puffy fair weather clouds, much like the last few days. There will be no rain once again today. 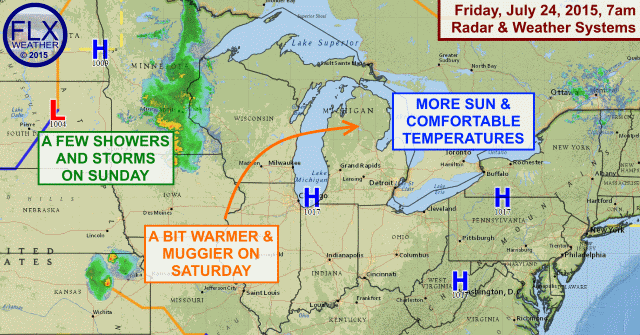 Temperatures will continue to add on an extra degree or two, with highs Friday mostly in the upper 70s to near 80º. Overnight temperatures will be a little warmer than the last few days, with mid and upper 50s for most areas in the Finger Lakes and some low 50s in the valleys of the Southern Tier. 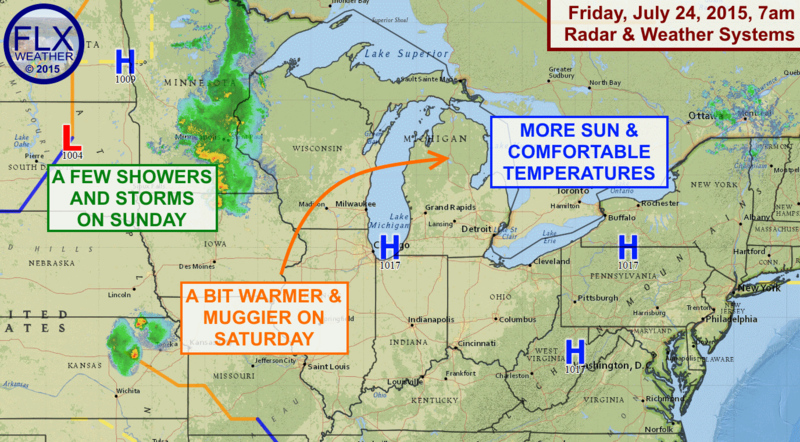 A few very subtle changes will start to show up on Saturday. The temperature will be warmer. The air will be a bit muggier. There will a few more afternoon clouds. And, over western New York, a few late afternoon showers or storms may pop up. A few of those may persist into the overnight hours as they spread across the Finger Lakes and linger into Sunday as a front moves through. Sunday won’t be a washout by any stretch of the imagination, and I bet some areas escape the weekend without any rain. Those that do so will end up going more than a week without rain, as another period of dry weather is expected Monday-Wednesday next week. The difference with this stretch of weather is that temperatures will not be so comfortable, with some hot weather moving in.